So, what does the discerning Bond fan — the one who feels “a martini, shaken not stirred” is just a little too gauche a reference — need to know in order to control the bar like Bond? Why don’t we take a quick journey through the literary Bond’s favorite drink: whiskey. According to the indispensable website Make Mine a 007 (007.atomicmartinis.com), Bond drinks no fewer than 317 drinks (the cinematic version lags behind at a paltry 114). 101 of those are whiskies or whiskey cocktails, with Bond heavily favoring bourbon over scotch — not an accident that Bond champions the American drink over his closer-to-home companion, really, since Bond also rails against the vileness of tea and expounds at length about why he prefers coffee. But scotch need not worry. Bond’s usual drinking buddy, the American CIA agent Felix Leiter, seems to have two functions in the novels: to slap his forehead and exclaim, “James, you’re right! Why didn’t I think of that?” and to order Haig and Haig scotch whiskey. To head across to Teleport City and pull up a stool at Bond’s Bar, click here. I had never ordered a Bond-style martini for the same reasons as you up until the Die Another Day premiere party. I had snuck myself in, in a bit of chicanery worthy of 007 himself (of which I am quite proud), but that's a story for another time. MGM spent a fortune on the party, converting the Dorothy Chandler Pavillion in Los Angeles into an "ice palace" with ice scuptures at every bar. "Bond Girls" wandered around like cigarette girls with some sort of game platform attached to their bodies for people to sample the latest Bond videogame, or go-go danced in bikinis. The open bars were sponsored by Finlandia, I think (was that the tie-in with that film? 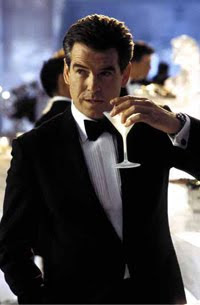 ), and being within a stone's throw of Pierce Brosnan and Halle Berry themselves, I couldn't help myself; I HAD to order a "vodka martini, shaken, not stirred." How could I not? "I bed everyone's ordering that here, huh?" I said to the bartender, trying to somewhat mitigate my nervousness. "Nope," he said disdainfully, "you're the first guy." It was embarrassing, but worth it! I would have kicked myself if I HADN'T drunk that drink in that environment! That looks like a cool site, though. Thanks for pointing it out! It will make future Bond drinking easier. Some friends of mine and I recently tried a Bond triple feature with two drinks that Bond drinks per movie. The Rum Collins from Thunderball was a very pleasant discovery which I had never had before, and after hating them at first, I eventually acquired quite a taste for Vespers… and that's not a good thing.